Learn German on a course at our language school in Augsburg, a beautiful university town in Bavaria, just an hour from Munich. If you learn German in Augsburg, you will find all the advantages of a university town but can still enjoy the ‘small town’ feel of Augsburg. While you learn German on a language course at our school, you can enjoy the frequent festivals, or visit such famous buildings as the Rathaus, the Perlachturm and the Cathedral. 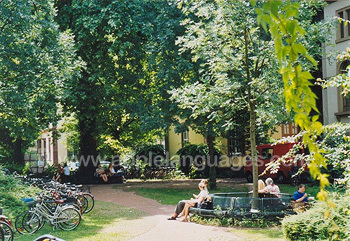 With cosy boulevard cafes and over 50 beer gardens in which to relax and to practice the German you learn on your language course, Augsburg is a superb place in which to learn German. 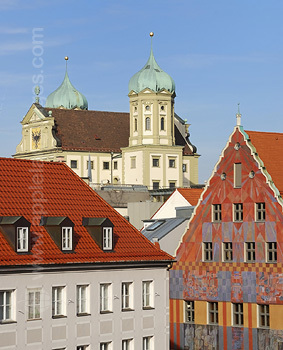 Our school in Augsburg, Bavaria, is located in a stylish ‘art nouveau’ building in Augsburg town centre. The school has 8 well-equipped classrooms, as well as an extremely popular school cafeteria, which students use as a meeting point both before and after their courses. 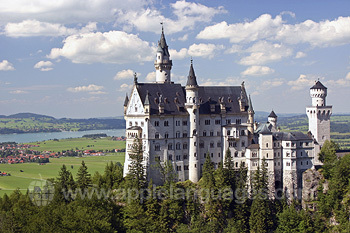 You can learn German with a Super Intensive language course including 25 lessons/week. Our Augsburg school also runs a DSH Exam course, to prepare foreign students for entrance to German universities. Students on German courses at our school in Augsburg can stay with carefully selected German host families, providing the perfect opportunity to meet local people and practice speaking German outside the classroom. Students are placed in single rooms, although shared rooms are available for students travelling with a friend or relative. Even though our school in Augsburg does not propose an activities programme, our colleagues will always be very pleased to provide you with information or suggestions to help you arrange your own activities. To get to Augsburg, simply fly to Munich. 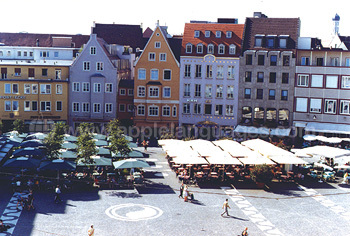 There is a regular direct coach service from Munich Airport to the centre of Augsburg. Alternatively, our school in Augsburg can arrange an airport collection service for you. Average score for our school in Augsburg based on 33 previous client reviews. My teacher was Siggi and he was fantastic! We all learnt so much and made great friends. I really enjoyed the course. Thank you so much Siggi! I really enjoyed my course and I learned a lot! My teacher was amazing! She was so knowledgeable and funny. I'm lucky to have been in her class. The Ackermann Family is fantastic! I absolutely loved staying at their house. They were so kind and generous. They catered to my every need. The room was beautiful and large and the house was in a peaceo neighborhood. I plan on keeping in touch with them in the future. Excellent experience all around. Thank you!! I came knowing little to no german and leave being comfortable and confident as well as knowing some german. My host family was very kind and had a real family feel. The food was great and they were very understanding and patient. The teacher was clear, amusing and very competent. The school loaned me the course books since I was short-term, which was helpful and saved me money. I would recommend it; nice atmosphere. About 2 hours homework daily. The house was clean, spacious, convenient and quiet. The landlord was very kind and provided loads of food and drink items free or at cost price and even did the laundry. He made a barbecue one night which was lovely. No English spoken at school or in the accommodation, which was helpful. Augsburg was unseasonably warm and much more attractive and interesting than I expected; I saw different sights every day. The school was really nice. Our teacher “Siggi” really made our lessons interesting and comprehensible. Thank you very much for everything! I stayed with Misses Kiederlie who has been a great German mother to me and who helped me in growing confidence. I really liked the school and I would love to come back in the near future. My course was great, I have absolutely no complaints. I just wish I'd been able to stay longer! Our hosts were everything we could have wanted. They were friendly and accommodating and the food was really great. The Language course was really cool, the teacher was always super nice and ready to help us anytime, but she was also serious. I feel like it helped me a bunch, definetely. The hostfamily was amazing, they were always really awesome and super nice to me and my Others roommates. Their place was nice as well. My course was very professional and i stayed with a host who was very kind and friendly. I attended the course in Augsburg, Germany. The classroom atmosphere was great, with all people from all different walks of life, achieving and learning the same language, working together well.The teachers are very helpful, pleasant to be around and very well organized. My accommodation was super, lots of room and plenty of studying space, the location was wonderful as it was in the Traditional German countryside. The school was wonderful and located in the heart of Augsburg. It was a great opportunity to freshen up my German and meet other students from around the world. The Host Family was wonderful too, I hope to keep in touch with themfor time to come. Well run with good teaching and helpful teacher. There was lots of homework but good progress was made. Learned a lot more conversational German, and improved my understanding of the structure of the language. Staff at the school were friendly. I would go again. 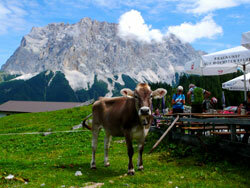 My accommodation was very good and the family were very very friendly. I felt at home and enjoyed my stay with the family. The course was intense but my German progressed immensely in one week, I'm very pleased with outcome. The teacher was first class. Staying with a German family and having no English speakers in the class was a real bonus as it forced me to use my German all day. My German improved, especially in terms of grammar. I stayed with a very friendly host family. Good, friendly, very much improved my German. Accommodation was wonderful! Excellent course, I learnt the language very quickly with the help of my host family. Definitely the way to go if you want to learn a language quickly. My host family were extremely helpful while learning German. I believe the easiest way to learn a language is to speak it every day and living with a host family certainly does that. It was a great experience, I learnt a lot about the German language and the culture. We found the course well balanced between conversation and grammar. Our host family was friendly and helpful and the food was good too. It was very well done, I found it interesting how successful the teachers were at teaching to each student in German without having to translate into one's mother tongue. The accommodation was very fitting for me, I am glad I was placed with real German people. They cooked wonderfully and were always concerned about my well being, such nice folk. I am going to use Apple Languages for every study abroad endeavour I attend.